#1359 Jon From Manchester England, "President Clinton" Visits NZ, Sweet As! True? Hi, I’m Sarah, welcome to The Daily English Show. This is the last regular show for 2010 and then we have one more show for you which will be an update telling you all about our summer tour. Today’s guest is Jon. I talked to him earlier this year on a mountain in New Zealand called Ruapehu where he was working in rentals in the Turoa ski area. Jon’s from Manchester in England and he said he’d been in NZ for a year. I asked him if he’d been working on Mt Ruapehu the whole time. Ah, no, I came here in, um, May and before that I lived in Napier, worked over there, and um travelled the South Island and the North Island in between times. 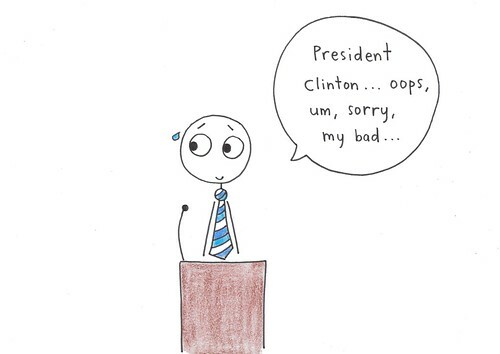 Kia ora in Stick News today the prime minister of New Zealand accidentally called Hillary Clinton President Clinton. Hillary Clinton is the 67th United States Secretary of State. Recently she visited New Zealand for a few days. 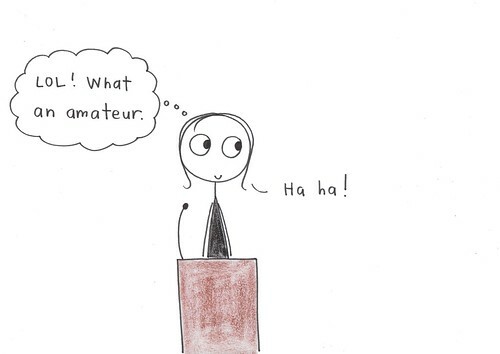 At a press conference the prime minister of New Zealand called her President Clinton. Secretary Clinton laughed and didn’t seem upset by the mistake. And that was Stick News. Hey, Hills! 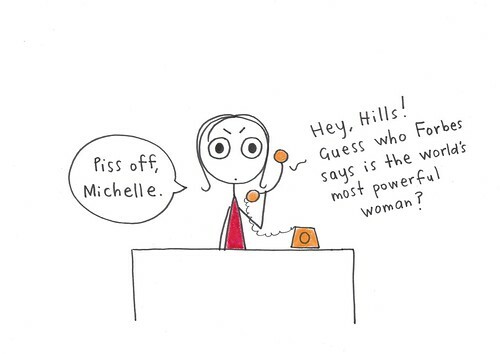 Guess who Forbes says is the world's most powerful woman? What's the name of this country again? New Zealand. 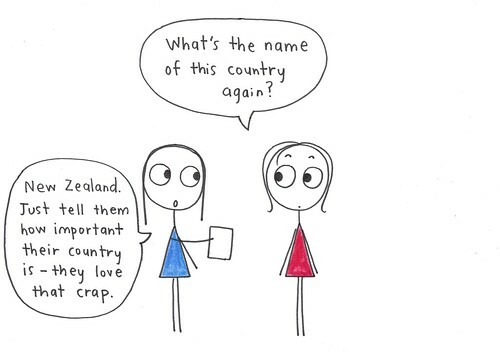 Just tell them how important their country is - they love that crap. #874 Do you ski or board? Step 2: Read Sarah’s lines and talk to Jon. Jon A bit of both. Done a bit more skiing this year, but I’m a snowboarder by trade. But, ah, it’s a good mountain to do both so try and get a bit of both. Sarah Which mountains do you usually go to back home? Jon Ah, I’ve done a season in France and Canada but last time I skied was in Austria and also Italy the year before that. Sarah How does this mountain compare to the slopes in Europe? Jon Very different, being a volcano for a starter, ah, and also being nowhere near, sort of, any of the other ski resorts other than obviously Whakapapa. Ah, and not having the valley, sort of, no tree-lined runs. Um, the snow here is probably a little bit less reliable as well, but it is a impressive mountain on its day, like today, ah when the sun’s shining and everybody’s enjoying themselves. Sarah Can you tell me some NZ English that you’ve learnt? Jon Ah, sweet as. Ah … oh, I don’t know, um, they say awesome a lot. They say, ah, true, like true as in, like, is that really true? Um, and there’s, there’s tons. Sarah Do you use those words? Jon Oh definitely. Yeah, all the time. They say in there …you know, we say oh yeah, the board’s going to be sweet as. And, you know, everything else … and if somebody says something you say “Oh, true?” And I say it on the phone to my, to my friends at home and they don’t have a clue what I’m saying, but um yeah I think there’s some really interesting words and it’s a nice, sort of, informal language really. Sarah What are you going to do in summer? Jon Ah, I’m going to go to Australia now that I’ve done my year in New Zealand. So I’m going to Melbourne, ah, next month and then I’ll try and get some work over there and see how it goes. I don’t think I’ll be skiing there, but, you know, getting on the beach and working on my tan I think. Sarah What were you doing in Napier? Jon Seasonal work, again, which is, sort of, what we’re limited to on the sort of visa that I’m on. Ah, so, picking fruit. Anything from asparagus, peaches, pears, apples, oranges, lemons, grapes … all sorts of stuff. Sarah What’s your favourite fruit to pick? Jon Probably, ah, plums cause I like plums so eat them as you’re going around. Sarah Can you speak any other languages? Jon A little bit, I lived in Greece for six months I did a summer there and then France for 6 months and then Canada for a year and I, I learned Spanish, German and French at school. But, in England … English is such a universal language, I just don’t think we get enough chance to practice. And even in France, unfortunately, being a ski resort and working for an English company, I was dealing with English people most of the time. But enough, I learnt enough in most of the languages to get by. Sarah Do you have any advice for people who are learning English? Jon Try and make it as fun as possible to learn. Cause, um, that’s what’s important with anything if you want to learn it. Same as snowboarding and everything else, it needs to be made fun by the instructor or by the hill or by the way somebody actually presents it to you. So it’s a case of, yeah, it’s hard work, but if you can have fun while doing it, then that’s the, ah, that’s the main thing. And that was The Daily English Show. Thank you for watching. We have one more show for 2010 and I will be telling you all about what we are doing on our summer break.